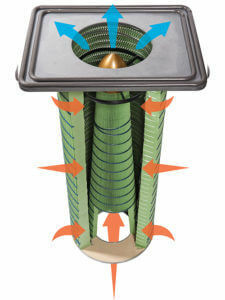 Expanded capacity due to the patented inner cone of filtration media. 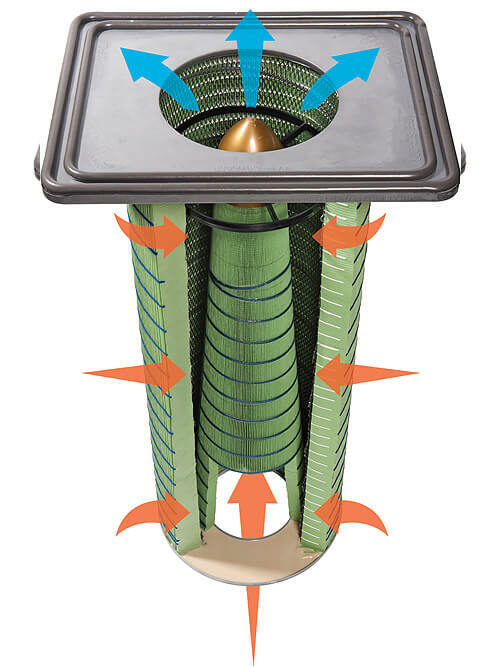 The inner cone provides uniform dispersion of back-pulsed air and opens up more usable space for airflow in the dust extractor. Camfil’s PolyTech™ media is the most advanced pulse-cleaned media ever made. All Camfil APC eXtreme filter media offerings deliver a minimum of 99.999% separation efficiency down to 0.5 micron by weight. Continuous double seal gaskets give added insurance against leaks. No other filter design gives you a double seal barrier. HemiPleat® filter technology ensures uniform pleat spacing with synthetic beads that hold the pleats of the filter cartridge wide open. The exclusive and patented Gold Cone in the center of the cartridge offers benefits unavailable from any competitive filter cartridges. Featuring an injection-molded inner cone in the center of the cartridge, cleaning is accomplished by pulse waves that emanate outward from this inner cone. Advanced cleaning provides more efficient operation, longer cartridge life, and reduced service requirements. Test results indicate that this new pulse distribution method provides enhanced cleaning and dust collecting efficiency.